Liver is very important part of our body. The main function of liver is to convert nutrients, absorbed by digestive system, into ready to use chemicals. Liver also removes toxins, certain chemicals and other waste products from blood and make them ready to be excreted. All blood of body passes through liver. The most common type of liver cancer is called Hepatocellular Carcinoma also known as HCC. This cancer starts within the cells of liver known as hepatocytes. Other types of liver cancers are called secondary cancers or metastatic cancers because these cancer start in some other parts of body and then spreads to liver and affect it later. 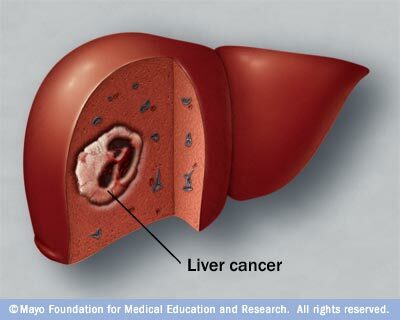 How Liver Cancer Can Be Diagnosed? Imaging tests including CT Scan, Ultrasound and MRI. Biopsy – In this test some tissues are take from liver and are examined under microscope. Please note that all these methods are very expensive, painful and have many side effects. These methods only work best when the liver cancer is at its earlier stages. You must consult an experienced homeopathic doctor to get right medicines for treating liver cancer. Click to see how Liver Cancer of Mrs. Ishrat was cured within 5 Months by homeopathic treatment of Dr. Sabeel. sir i have some sextual problem. Aoa Shahid Iqbal, Please contact at this phone number: 0300-5125394 do discuss your issue in detail with Dr. Sabeel. Your problem is curable and there are very effective remedies for sexual problems in Homeopathy. I was having liver cancer I consulted many doctors and even gone through chemeothrapy and radiotherapy but still no impact. then someone suggested me to visit Dr sabeel initially I didn’t believe but by consulting him I was surprised to see the results.my immunity was improved up to remarkable extent..my prayers and regards for such an experience. Sir my father has liver tumor last six month diagnosed 8.5cm doctor done tace for one time but after ct scan doctor says 2nd tace option cannot be done due to portal shunt so i am worried about my father health i love him very much his age is 64 yrs. Some body say me liver tumor cureable in homeopathic please help me for this treatment. My father has been diagnosed Metastatic liver cancer earlier this month. The doctor did not advised him to undergo chemotherapy, we give him vitamins and herbs medication. What would be the other option for my father? Your reply is much appreciated. Thanks! Sir my brother age 47 has liver liver tumor last six month diagnosed 6.8 x 5.9 cm doctor done tace for one time and suggested 2nd tace . Can Homeo treat is effective for this . AOA. DR SABEEL KASY HAI. SIR MARI MOTHER IN LAW KO LIVER CANCER HAI STAGE 4TH HAI SO KINDLY KOI TREATMENT HAI ES KA . COZ IM HOMEOPATHIC DOCTOR FROM FAISALABAD. I am.writing to you from Punjab, India. During first week of Dec 2017, My mother was diagnosed with last stage of liver cancer (HCC), Chronic Liver Disease, Liver Cirrhosis, and Hepatitis C. Hepatitis C has been cured by allopathy. My mother doesn’t have any trust on allopathy and I think thats why allopathy medicines are not working on her. Her condition is much worse now. She is in pain and after 3-4 days she has to undergo tapping for fluid removal. Do you have any treatment for this stage. Her age is 65 years. Her AFP is more than 20000 now. Also her lesion size is approx 10.9×9.8×9.7.